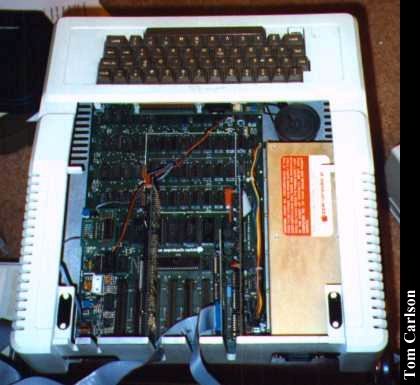 Part of the historic Apple ][ line, the Apple ][+ filled the gap between the Apple ][ and the more capable Apple ][e and Apple ][c. The twin drives each hold around 140k-160k, depending on who I ask. The Apple ][ line-up was a staple of school for years. This particular computer was rescued from the Granite Falls Middle School. Unfortunately, no disks were available. After digging through piles of old Commodore 64 disks, I managed to find a few Apple disks. 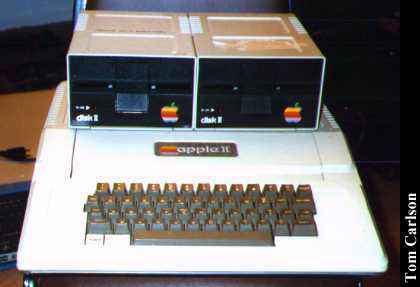 However, all but one required an Apple ][e. One lone disk did work, providing a few fun games. The Apple ][ line was enormously popular in its heyday. After a few stumbles, namely the Apple /// and the Lisa, the Apple ][ line led to the equally impressive Macintosh line, starting with the Mac 128k. Inside the Apple ][+ - Very clean design. Woz did really nice work, didn't he. 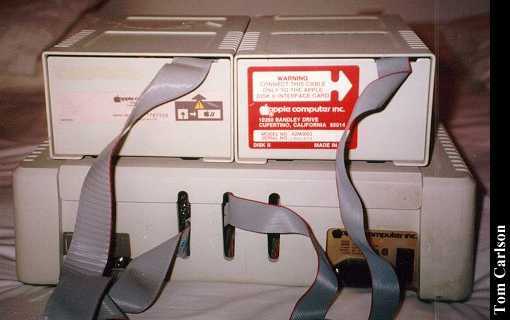 Back view of the Apple II, showing the cables running from the drives into the slots in the back of the unit. Click here to view all comments for the Apple ][+ and to leave your own.